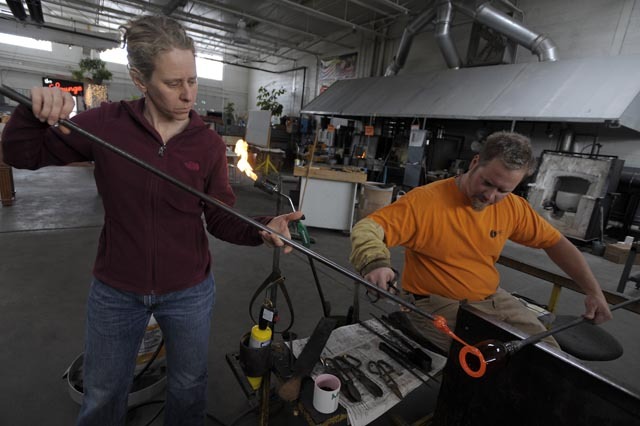 In early March, Plucinsky, left, helped husband Chris Nordin add a layer of molten glass to a flower he was sculpting for the exhibit. Plucinsky and Nordin are the creative visionaries and lead designers behind the Furnace, which is known for producing glass artworks for commercial and private clients including Quicken Loans Headquarters, Marriott Hotels, area hospitals and the Somerset Collection. They met in 1990 in the glass shop at College for Creative Studies (CCS), founded their company in 1991, and married in 1998. The duo has spent the last six years working out of a former tool and die shop on an industrial backstreet in Dearborn.